Sometimes a teen will ask me for research help and I have to quickly Google the topic before I know what she’s referencing. It’s embarrassing. Of course by that, I mean inwardly embarrassing; I’m so good at playing off like I’m searching for books that they don’t even know that I’m Googling. Secret: librarians are Google masters. But hey, I no longer have the luxury of being forced to learn information every day. Plus, the information these teens are getting is (hopefully) an updated version of the stuff we got back in the day. By the way, at age 27, I say “back in the day” far too often, but I think it’s justifiable because I used to type my school projects ON A TYPEWRITER. Long story short (too late), one of my 2015 resolutions is to read more nonfiction. First, because it will increase my knowledge base and ability to help teens with their research projects. Second, because believe it or not, teens appreciate a solid nonfiction read if it meets a variety of requirements. 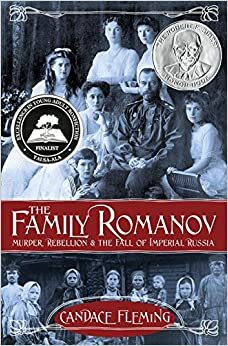 The Family Romanov: Murder, Rebellion, and the Fall of Imperial Russia, by Candace Fleming, meets these requirements. There is mystery, royalty, murder, disgusting treatment of the lower class, and possible magic. These are all of the ingredients of any blockbuster YA dystopia book/movie series. Yup, this book is an easy sell. Fleming takes these ingredients and presents three intertwined tales with a narrative flow rather than a textbook feel. We get the story of the Romanovs—their obsession with maintaining their dynasty, their ineptitude at raising leaders and making decisions, and their complete willingness to let a mystical man assume the role of master puppeteer with their country. Contrasted against their opulence is the working class and their budding revolution. Lastly, there are devastating and insightful firsthand accounts of Russians’ lives that further work to demonstrate just how out of touch the royal family was with its subjects. The bibliography is also a huge selling point. I cannot stress enough how important a bibliography is for proving that you are, in fact, a master of the topic. Not only does Fleming list her sources, but she has a separate section for just primary sources AND internet resources. It’s a procrastinator’s dream! Despite knowing it all along, having the truth about the Romanovs written out in such an accessible format was a bit of a soul-crushing blow. Anastasia has always been one of my favorite movies and this book really messes with the historically inaccurate animated adventure. Don’t get me wrong; that’s a GOOD thing. We live in a world where some people don’t realize that the Titanic was not just a James Cameron epic. We need to get smacked in the face with non-Hollywood truth every now and then. But there’s no Bartok the Bat in The Family Romanov. I don’t want to live in a world where he wasn’t a factor in history. I just don’t. The one real major problem I had with this book was picture placement. The book is split into four parts. Pictures that coincide with the first two parts are grouped together after part two, and those that coincide with the final two parts are located at the very end. I much prefer when pictures are a constant presence in a book. They break up the pages into readable chunks and keep the reader focused on the information at hand. Spacing the pictures so far apart from the matching information is a bit of a pain. However, I was reading the ebook version and I don’t know if the print version follows the same format. Otherwise, the fascinating topic, the readability, and the amazong sources make this book worthy of the many, many honors it has received since its publication. Read this, especially if you want your childhood ruined. Nicole Perrault is a teen librarian (a librarian for teens and not, as many patrons believe, a teenaged librarian) in the Boston area. She loves YA lit because even the most grotesque, apocalyptic novels end on hopeful notes. You can follow her library adventures on Instagram at @medfordteens. Please tell me you’re kidding about the Titanic comment. PLEASE. I’m definitely going to check this one out, the Romanov family has always intrigued me. (Started, of course, by the movie). I loved this book! In fact, I’m booktalking it at a library program next week. I really struggle with nonfiction sometimes, but this was like a weird, unbelievable novel. If you’re looking for more good nonfiction, Candace Fleming also wrote a great book about Amelia Earhart. I love books about the Romanovs. Will have to check this one out.